Working with hundreds of financial advisors on their social media marketing strategies, blogs, and websites, we have learned a thing or two. We work to help financial advisors identify and implement ways to effectively and efficiently use social media. In doing so, we quickly discovered a few secrets to success. Follow these tips to ensure you don’t end up creating a great plan only to watch it collect dust on a shelf. One of the first tasks we give to advisors who work with us on their social media is to create a list of their top three goals (or reasons for being on social media in the first place). These goals should be well thought out and as specific as possible. For example, the goal “I would like to increase my followers on LinkedIn” is not as productive the goal as “I would like to increase awareness of the fact that I also provide tax preparation services and demonstrate my expertise in this area to my network on LinkedIn”. 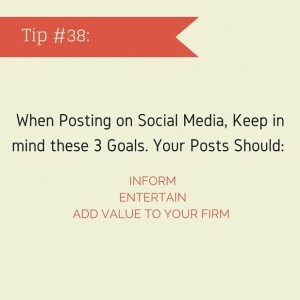 HOW TO DO IT: Think about what you are trying to accomplish with your social media presence. Do you want existing clients to learn more about other services you provide? Do you want to connect with more of your peers and become well-known in the industry? Do you want to portray your expertise in a particular subject matter and be approached by publications to produce content? Each goal will carry with it a different set of tasks and strategies, and the more specific you are, the easier time you will have both tracking your progress and being successful overall. Once you set your goals and develop your plan, you will be able to use Google Analytics to measure your progress to adjust as necessary. THIS IS VERY IMPORTANT. I can not stress this enough – BE REALISTIC about what you have time to do. In the initial excitement of talking about all of the various possibilities and ideas you have for your social media, it is very easy to get swept up and end up thinking you are going to write 3 blog posts per week and 1 whitepaper per month and put together 3 newsletters for various audience segmentation monthly as well. And maybe you will. But if you are running a small business and you have a million other hats to wear, maybe you won’t. The last thing you want to do is set yourself up to fail, because as we all know, if you fail right out of the gate, it will severely hurt your confidence and ability (and motivation!) to continue. It is a MUCH better idea to start small and scale up. Once you have answered these questions, I then recommend signing up to use a service like Hoostuite, Hubspot or CoSchedule (many have free options) to help you auto-post to all of your social media networks – a huge time saver and the best way to plan out your month/quarter in advance. Many advisors we have worked with want to be on social media, but do not want to create their own original content. Instead, they decide they will simply curate the content that is already out there and share that instead (sharing WSJ and Forbes articles for example). 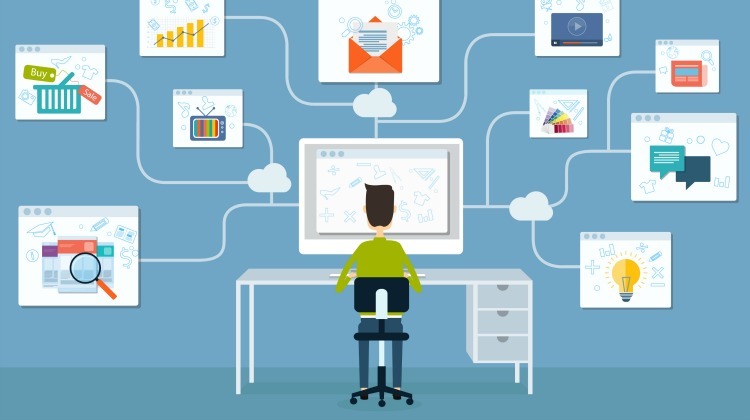 Sharing the content others have created (what we refer to it as third-party content) can be an important component of your social media strategy, but unfortunately if you want to drive traffic back to your website and turn visitors into quality leads, it cannot be the ONLY component. You must produce at least some your own content. HOW TO DO IT: I don’t care if you call it a “blog” or “insights” or “my online newsletter” – just make sure you have a place online where you can share your own thoughts and produce original content. If you do it right, your clients will enjoy getting a behind-the-scenes peek at how you process the latest financial news, what books you are reading, and any other thoughts you decide to share, while prospective clients will get a feel for your overall and learn more about the how you serve their specific niche. The easiest way to get started is to write what you know. Think about the questions that the clients you currently serve (and those you WANT to serve) typically have. What do you envision them typing into Google search? Work backward from those questions, and you not only quickly come up with ideas, but you will be providing valuable answers that will translate into positive search results. The more you do this exercise, the better you will get at it. (Also, CoSchedule.com/blog is a great place to find resources to help you blog faster and smarter). Choose one topic, set a timer for 3 minutes, and brainstorm as many headlines as you can on that single topic. Don’t edit as you go. Don’t second guess. Don’t stop or slow down. Every idea is good. Write it down no matter what. When the timer buzzes, stop. 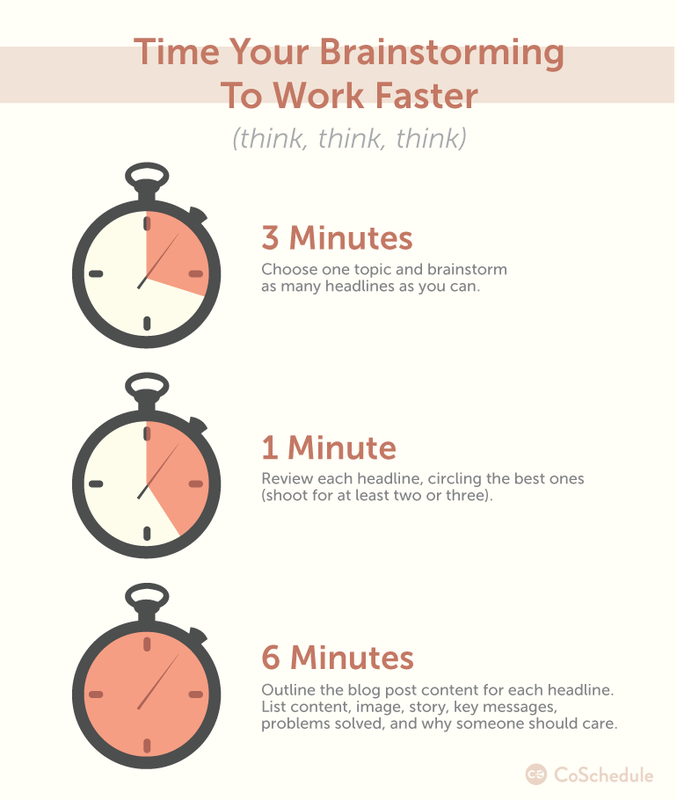 Set the timer for 6 minutes and in that time, quickly outline the blog post content for each headline. List what content to include, image ideas, story ideas, key messages to communicate, the problem it solves, and why someone should care. If something doesn’t come to you for a headline right away, skip it and move on. At the end of this exercise, you’ll have at least a few great posts on your topic that are already halfway done. You just need to finish them up later. What are you waiting for? 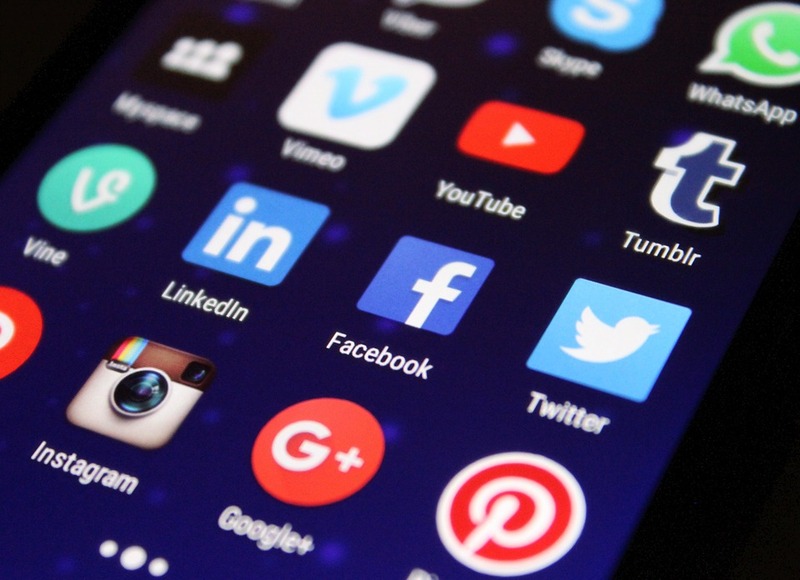 Get started with your social media strategy today or contact us to help. Join the Twenty Over Ten newsletter to get useful tips & valuable resources, delivered monthly.